OnDeck is an online loan company that offers help for small businesses in need of some extra money during rough stretches. It’s particularly suitable for businesses that don’t qualify for a classic bank loan. 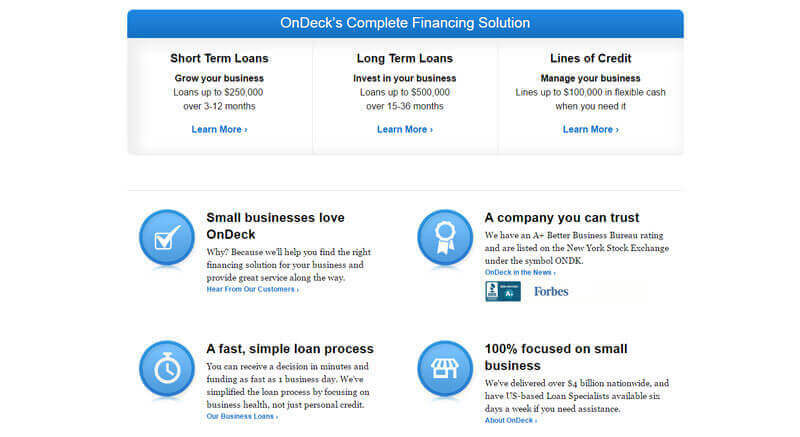 OnDeck offers loans up to $500,000 for small businesses and credit lines up to $100,000. The company started in 1997 and has funded over $7 billion in loans since it was founded. 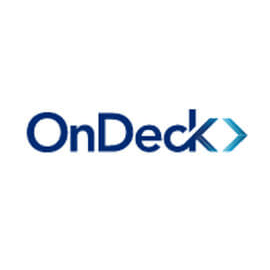 For more useful information, keep on reading our OnDeck review. 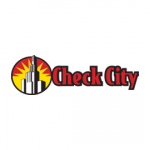 This company is ranked #3 on our Best Small Business Loan Companies list. Small business loans are loans designed to help companies that need money and need it quick, but are not eligible or do not qualify for a bank loan. Small businesses are particularly vulnerable in this day and age, with the economy being the way it is, and many of them find themselves in money trouble, especially in the beginning. And that’s where companies like OnDeck come to the rescue. OnDeck offers short term and long term loans, as well as lines of credit. Short term loans go up to $250,000 for three to 12 months. If you apply for a long-term loan, you can borrow up to $500,000 for 15 to 36 months. Lines of credit go up to $100,000 in flexible cash. OnDeck has an A+ rating with the BBB and provides very fast and convenient services. They are available six days a week and their customer support is terrific. The service is ideal for restaurants, beauty salons, car repair shops, doctor’s offices, and any kind of small retail or service business. OnDeck is absolutely and exclusively focused on small businesses, which really shows in the way they understand the difficulties that these businesses sometimes encounter. One of the benefits of using OnDeck loans is that your timely payments get reported to the major credit bureaus, improving your score. There are also loyalty benefits, as well as a handy application that allows you to draw or make payments anytime you like. OnDeck looks at companies’ actual performances, not so much their credit scores. Thanks to this, even businesses with poorer credit statuses have a chance of getting a loan. The loans are not unsecured, but the company does not require any specific collateral. Instead, the loans are secured by a lien on the business assets. You can choose between applying online or by phone. 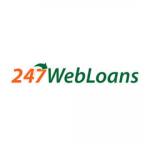 Both ways are convenient – online application perhaps gives you more freedom and comfort whereas phone application allows you to ask everything you want while talking to the company’s loan application operator. In order to qualify for a loan with OnDeck, your company has to be at least a year old, at least one of the owners has to have a credit score of 500 or higher, no history of personal bankruptcy, and business revenue of at least $100,000 in the last year for term loans and $200,000 for lines of credit. Also, certain industries are not eligible for a loan, including banks, lawyers, pawn shops, funeral services, travel agencies, real estate brokers, and several others do not qualify for a loan with OnDeck. The complete list of restricted industries can be found on their website. You will be asked to provide a business tax ID, credit card statements for the last three months, bank statements, your driver’s license number, and your social security number. Once you complete the application, it will only take a few minutes for OnDeck to decide whether you will be approved a loan. If you do get one, the funds will be transferred to you the following business day. Depending on the specific loan you choose, the company deducts a predetermined amount of money as repayment on a daily or weekly basis. These payments are fixed in your best interest, as you agree on a sum that will not affect your cash flow. It also prevents the so-called snowball effect, in which missed payments only lead to high amounts of accrued fees and penalties. In case you don’t have enough money and miss two consecutive repayments, the company will offer you a payment plan. For example, it may pause the payments for a month until you gather enough money. As indicated in our OnDeck review, this company does have somewhat higher APRs and other rates than most bank loans, but that’s because it caters to clients that are generally not eligible for bank loans. The payments are flexible, which is very convenient and prevents you from ending up with a humongous debt, the service is fast, easy, and reliable, and the customer support is great. In addition, returning clients get cheaper loans and the service also allows you to improve your business credit. No collateral you say count me in! When I saw an A+ rating with the BBB, I knew I was in good hands.